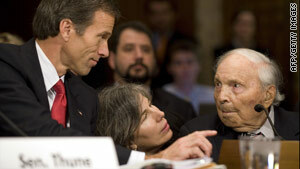 Sen. John Thune of South Dakota helps Frank Buckles, right, speak before a Senate subcommittee. Washington (CNN) -- The last surviving U.S. veteran of World War I, former Cpl. Frank Buckles, turns 109 on Monday and is still hoping for a national memorial in Washington for his comrades. Buckles is expected to deliver remarks during a quiet celebration Monday afternoon at his home in Charles Town, West Virginia. But the old "Doughboy" -- as World War I American infantry troops were called -- has already been outspoken in recent years, urging congressional lawmakers to give federal recognition and a facelift to a run-down District of Columbia memorial in an overgrown, wooded area along the National Mall. In December, at 108, Buckles testified on Capitol Hill as lawmakers considered whether to fund renovation and give the site "national" monument status. But rival legislation seeks the "national" designation for a 1920s-era memorial located in Kansas City, Missouri. Congress has not yet decided on the legislation. In 2008, the old soldier came to Washington and visited that 1930s-vintage District memorial. In his wheelchair, helped along by a military aide, he slowly crossed the cracks in the flagstone walkway, and saw the cracks in the marble gazebo. Still sharp at only 107, he noted during that visit that the names engraved along the gazebo's marble walls are only of those who hailed from District of Columbia. Buckles that day also met with then-President George W. Bush at the White House and Defense Secretary Robert Gates at the Pentagon. Later in 2008, Buckles was the guest of honor at Veterans Day ceremonies at Arlington National Cemetery. He said he considers it his duty to represent his fellow soldiers. "I have to," he told CNN, "because I'm the last living member of Americans," who fought in what was called The Great War. As a soldier in the U.S. Army, Buckles was an ambulance driver for U.S. forces in Europe, and once met commanding Gen. John Pershing, near whose grave the more recent Veterans Day ceremony was held. Buckles was warmly greeted with standing applause by those in uniform and others who had gathered for the commemoration, but he said he did not think the fuss was about him. "I can see what they're honoring: The veterans of World War I." "Time has passed very quickly to me," he told CNN after a wreath-laying, "I've had a lot of activity in the last 90 years."